The first time I ever encountered potato tacos, I was 17. It was a Sunday—band practice day. During a break between overly angsty fits of distorted guitar, our chief songwriter, David, said to me, “Let’s go get potato tacos.” I’d never heard of such a thing. Even though I lived just across the Mexican border, I was raised on taco shells out of a box, heated in the toaster oven and filled with ground beef. The idea of “potato tacos” was completely foreign to me. The taco shop we visited was called El Norteño #2, in Chula Vista, south of San Diego and just north of Tijuana. It was a shoebox of a place with a drive-thru and only two tables out front—concrete circles with broken ceramic tile mosaics embedded. Two tacos cost 99 cents. They came wrapped in cheap yellow paper that made a half-hearted attempt to absorb some of the grease from the fried-to-order crispy shells. Inside there was a mashed potato filling, with maybe a little salt and garlic, but not much else. On top, shredded cheese—the yellow-orange plasticky kind—and a hand flick of shredded iceberg lettuce. That was it. At the time I was newly vegetarian, and the potato taco was a revelation. A meatless, carb-heavy taco was perfect for me. (And I’m of Polish descent, so anything potato-related feels homey.) My meager paycheck from scooping movie theater popcorn didn‘t exactly cause my chain wallet to bulge at its seams, so the two-for-a-buck price was also right. To this day, whether it’s for late-night cravings, morning hangovers, or just midday hungry, my go-to is a potato taco like those I first discovered at El Norteño #2 (sadly, now closed), then again a short time later at La Jolla’a Don Carlos Taco Shop (where the potatoes come lightly spiced). Over two decades, I’ve asked almost every taqueria I’ve visited, “Tienes tacos de papas?” I’ve entered hundreds of futile Yelp searches. But the crispy golden taco filled with the root vegetable is, for some reason, not very common. Most taquerias do not offer the taco dorado de papa. To be clear, I’m not talking about those soft tacos with diced “papas y rajas.” Neither am I endorsing anything with a sweet potato in it. 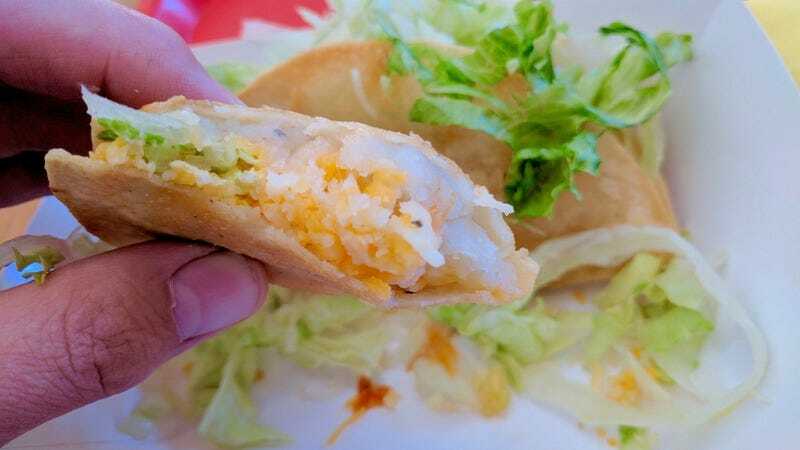 They should be hard potato tacos with shells fried to order; crunching through the crisp, oil-coated exterior into the warm, fluffy interior is another world altogether. The potatoes must be smashed—not diced or cubed—because you shouldn’t be too fancy about it. The potato taco should be about cheap, instant satiation. Gustavo Arellano—who, as author of both the OC Weekly’s ¡Ask A Mexican! column and the book Taco USA: How Mexican Food Conquered America, is more an authority than me—tried to explain why my idea of taco perfection is not more widely available. “Potatoes are just a filling—no more, no less,” he says. There’s no cultural touchstone for the variation on the hard, fried-shelled taco developed north of the border. ”They’re labor-intensive,” he adds, “and taquerias are all about having the meat and tortillas ready as fast as possible.” Arellano does say that the taco de papa becomes much more popular during Lent, when Catholics—who make up the dominant religion in Mexico—abstain from eating meat. But here’s my pitch to any taqueria owners who might be reading this: Offer the potato taco. Look, I get it. Why add something that’s made-to-order, requires more work, and turns a smaller profit margin? But the demographic of your customers who are vegetarians or cheapskates—or vegetarian cheapskates, like me—will thank you with their loyalty.